Need an easy, amazing, simple, fall-back dinner idea? This is what we eat all the time. At least once every two weeks. I am serious. I make my own sourdough bread (another post some day), and so I always have bread and sandwich items on hand. There are so many variations of the panini – but I pretty much make the same idea every time. We eat this with our favorite fruit bowl, and it is the perfect summer anytime meal! I make ours on my beloved George Foreman, but here is a clever stovetop technique! Spread the slices of bread with the mustard. 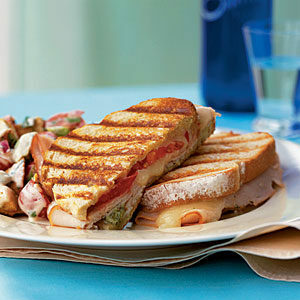 Layer each sandwich with a half slice of cheese – then lunchmeat – then salami – and then the other half slice of cheese. (Flanking the meat with cheese holds it all together!) Press in grill or on stove for a few minutes until dark and crispy. Enjoy! Sometimes I use shredded cheese or shredded chicken as alternatives. This is really good with tomato too.